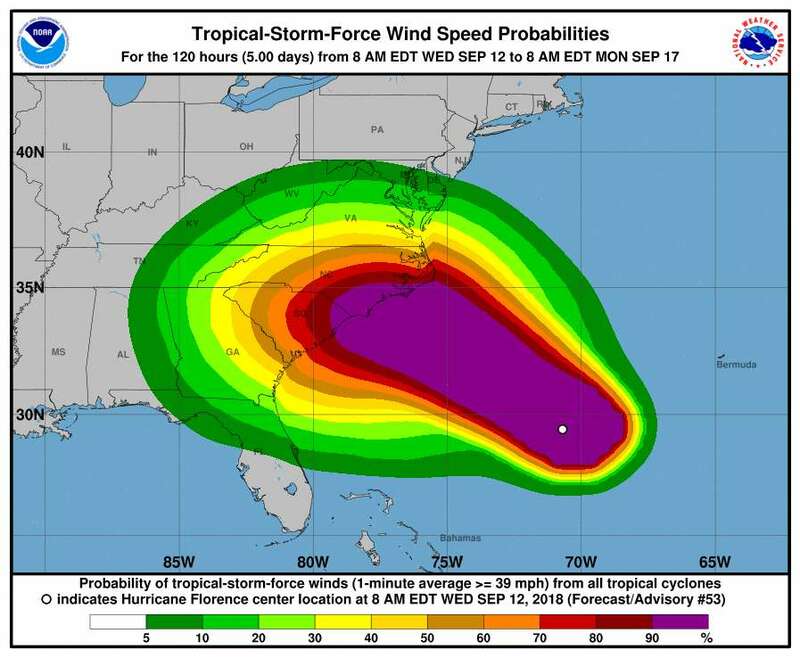 Hurricane Florence continues to barrel towards the Eastern US with winds reaching up to 130 miles per hour (over 200 kilometers per hour), forcing at least 1 million people in the Carolinas and mid-Atlantic states to evacuate. On the eve of the Category 4’s arrival, one North Carolina volunteer fire department put together a list of hurricane preparedness hacks that has since gone viral. As the Gold Hill Volunteer Fire Department notes, these tips were found online or submitted by Facebook users, and we can’t guarantee they will all work – try at your own risk! 1. Put ice in a washing machine for a cooler for perishable foods should the power go out. As the ice melts, it will drain through the washing machine system. A note that this is a very temporary hack and you will need to cycle water out in the spin cycle as soon as the power comes back on. 2. Fill your bathtub with water. In case the power goes out, you’ll want a backup reserve of water for toilets, washing, and other uses around the house. There are also some really nifty gadgets to help keep the water clean. 3. Strap a headlamp to a gallon jug of water to fill the room with light. 4. Freeze resealable bags three-quarters full with water for an extra reserve of ice to keep freezers, coolers, and washing machines colder longer. 5. Turn off and disconnect your electronics in case of a power surge. A surge of electricity can destroy the inner workings of computers and other electronic devices, according to NBC. When the power goes out, be sure your electronics, including appliances, are unplugged. 6. Take photos and inventory of your belongings before the storm hits for insurance purposes. Depending on your insurance provider, you may also be required to send after photos and receipts of items purchased. While we’re on this note, not all home or renter’s insurance policies have flood insurance and many require you have it in place at least 30-days prior to the event. Call your company to find out more. 7. Keep important documents in a safe, waterproof place. Store insurance policies, marriage licenses, birth certificates, personal memorabilia, and any other important documents in waterproof bags or containers. To be extra safe, take digital copies. 8. Make sure you’re able to cook if needed. If you have a grill, make sure it’s ready and propane tanks are full so that you can grill or cook any frozen meat. Biodegradable plates, cups, and utensils are useful during a power outage because they require minimal cleanup. 9. Build yourself a phone charger. To save battery power, put your phone in airplane mode when you don’t need it. If you need to charge it when the power goes out, FOX5DC put together a nifty guide to making your own charger. You’ll need the spring from a ballpoint pen, a cigarette lighter car charger, charge cord, 9V battery, and tape. 10. First and foremost, follow instructions given by emergency personnel. If you are ordered to evacuate then you definitely should. Every home should be equipped with enough food and water to last each person at least 72 hours. Be sure to have a medical kit and any needed prescriptions on-hand in case you are stuck for several days. Don’t forget that pets are family too – be sure to account for their needs during disaster preparedness as well. And whatever you do, please refrain from shooting at the hurricane (we had to say it, again). Previous articleSleep: how much do we really need?